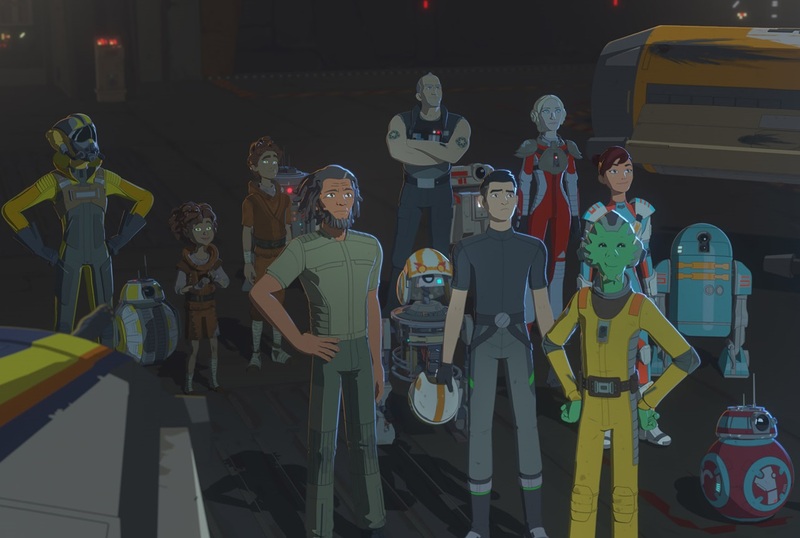 The season one finale of the animated series Star Wars Resistance aired last night, bringing to a close an exciting run of twenty-two episodes. The finale had many surprises that upset the status quo and set the stage for an exciting second season (likely debuting this Fall on Disney Channel). The series' executive producers Just Ridge, Athena Portillo, and Brandon Auman sat down recently with Entertainment Weekly's Anthony Breznican, where they discussed what went down in the finale and let slip a few teases about season two. SPOILER ALERT: The following discusses the Resistance season one finale ("No Escape, Part 2") in detail! If you haven't seen it yet (and don't want to be spoiler) stop reading now. One of the highlights of the finale comes when the Colossus finale takes off into space, making the jump to hyperspace top escape the First Order. When asked about how the reveal that The Colossus is a space station, Ridge offered a little insight into how this will shake up the series for season two, saying, "In season 2, it’s “What do they do? How do they evade The First Order? How do they try to join up with the Resistance?” Having the base, the Colossus, be a ship is such a cool moment at the end of season." "It’s kind of interesting to put the pirates into the mix, to see how that’s going to toss up the living situation being stuck out in space, on the run. Now we’ve got this sort of unpredictable factor. But they’re all really just trying to survive together at this point. We don’t want to give away too much about what’s going to happen in season 2, obviously, but it’s definitely going to make things interesting for the residents of The Colossus. To now deal with, not only being on the run but having pirates on the ship." "Her disappointment and confusion grew throughout the season, so when Agent Tierny showed interest in her and presented her with the opportunity to live her dream, you can understand why she decided to join the First Order. (...) Sadly, it was a series of misperceptions and hurt feelings that have now dragged Tam away from being with her family, her heart. Instead of focusing on what matters most, like fighting for her team, she selfishly chooses to go with what matters most to her in that moment, self-gratification." The next time fans get the chance to hear from Ridge, Portillo, and Auman about Resistance will likely be next month at Star Wars Celebration, where a Star Wars Resistance panel will take place on Monday April 15th with the executive producers and members of the cast. The panel will look back at season one, and offer some exciting looks ahead at season two.